Yesterday we hit the farmers market and it seemed everyone had tons of peaches and nectarines. One stand was selling their not-so-pretty ones for $1 a pound, and I couldn’t resist loading up. We selected a couple of other items, but even before we made it home, both the tot and I had eaten our share of those nectarines. Amazingly, a big bowl was still left over. 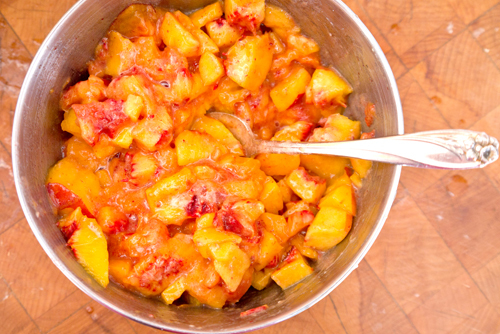 So, what to do with nectarines? They are great eating solo, but some were ready to be gobbled up now, and I knew we would both suffer tummy aches if we munched any more. I left them on the counter overnight and then, bright and early this morning, I had the perfect idea. 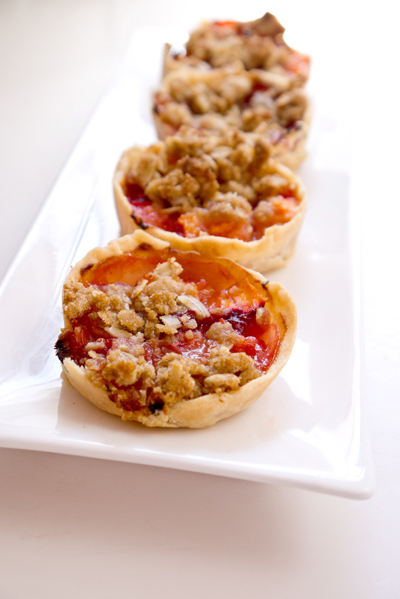 Mini nectarine pies. WITH crumble on top. I started out by making up a simple pie dough. If you don’t feel like making your own, don’t. Just head over to your favorite market and pick up pre-made pie dough. Easy as that. Toss the ingredients into your food processor and pulse until things come together. Wrap up your dough in plastic wrap and cool in the fridge while you get everything else ready. Next I peeled and chopped those nectarines. Sure, some skin ended up in the mix, no big deal. I sliced and diced about 2 cups worth of nectarines and added 1 teaspoon flour and a dash of vanilla, and gave everything a good stir. Then I mixed together the crumble topping by fork blending 2 Tablespoons each of butter, flour, oats, and brown sugar. Once the mixture resembles coarse sand, you are good to go. Go ahead and preheat the oven to 375 F.
Grab that cold dough from the fridge and roll half of it on a flour dusted work surface. Try to roll the crust as thin as possible and then get out your muffin tin, a large glass, and begin cutting rounds and gently placing them in the muffin tin. If you need to roll more dough, get rolling. Any left over dough can be wrapped up tight in a plastic bag and saved for another pie making day. 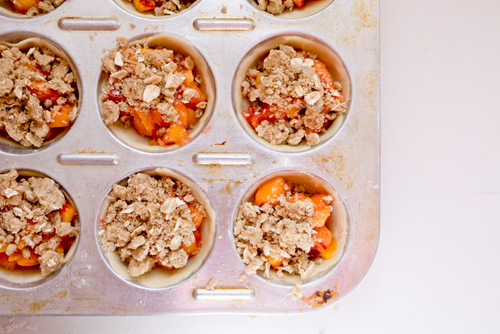 Now spoon the nectarine mixture into the tins, evenly distributing the filling, and then top with the crumble. Pop your mini pies in the oven and bake for about 20-25 minutes, or until the tops are bubbly and the edges of the crusts are nicely browned. 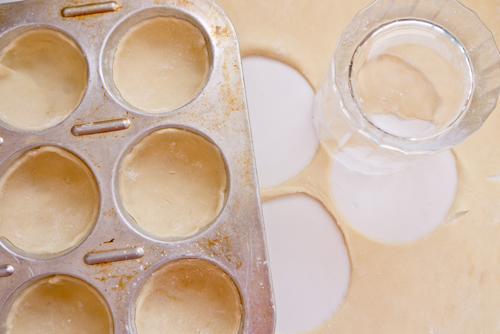 Let them cool in the muffin tin for 10-15 minutes before removing. Be delicate with your mini pies – use a knife or fork to help remove them from the tin, and then serve plain or alongside a big scoop of ice cream. 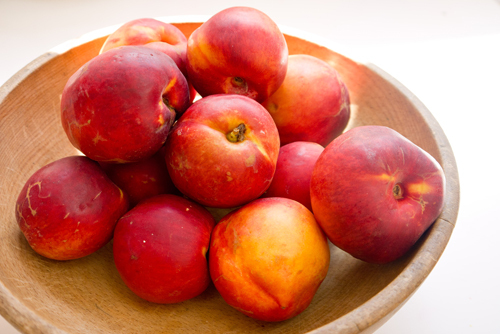 peaches or fresh berries – just as tasty. Oh man, the peaches on my tree are getting ripe. Pie it is!